Many executives plateau in critical interpersonal and leadership skills because as individuals advance to the executive level, development feedback becomes increasingly important, yet are more infrequent, and more unreliable. Leaders need a thought partner and sounding board to express their ideas without fear of political maneuvering and reprisal, or self censorship. The expression lonely at the top is true for executive leaders because what keeps them up at night directly affects the company and all its employees. And because you have to do more with less, coaching can help you leverage your resources and quicken your lead time. Develop your leadership and your high potentials leaders faster. Stakeholders are looking to CEO’s and Executives, not only as business leaders, but also as community and social leaders. How are you addressing the issues that confront businesses today? That's what leaders of the 21st century are going to have to ask and answer for themselves. And the companies that are going to be successful are the ones that develop leaders who are value driven, able to engage and communicate effectively with their talents, generate loyalty and camaraderie, align goals, values diversity, and create triple bottom line profits. How do you get your leaders and their teams on board to do that? "You will shift from managing others to managing yourself with others." Able to continue doing business and attracting talented leaders. There are three informal phases of the coaching process: (I) Discovery and Design, (II) Executive Coaching, Leadership Development and (III) Measurement. A 6-12 month timeframe is expected for the initial engagement which allows you the needed time to make progress towards your coaching goals and integrate sustainable change, although many clients choose to continue the coaching relationship thereafter. The discovery session is used to allow our designated coach to better understand your professional responsibilities and goals, values, strengths and specific coaching goals to increase your own effectiveness. Assessments and 360 interviews are used as a foundation to prepare for, initiate, and coach behavioral changes. You will have an opportunity to complete assessments such as the MBTI®, CPI 260™, TKI, Leadership Practices Inventory, or FIRO-B® all designed to assess work-related preferences, conflict management style, and leadership characteristics. We will provide feedback of the reports in an assessment debrief session where we discuss themes, strengths, outline potential blind spots, development areas and refine the coaching goals accordingly. Our coaches are fully committed to helping the client unleash their full potential and perform to their optimum. Using a systemic approach, our coaches will help you discover your leadership style, communication style, and motivational currency. With the goal of increasing personal awareness of behaviors that affect team morale and job performance, as well as skills and competencies that are needed in your current and future roles. There will be emphasis on leadership development and skill building in the areas of feedback, change management and conflict management. Our role is to help you discover your strengths and use them in a way to help increase your effectiveness as a business leader and achieve bottom line results. In collaboration with HR, customize development plans are done for each of client. Weekly one-on-one coaching sessions are done in person or by phone for a minimum period of six months to a year. 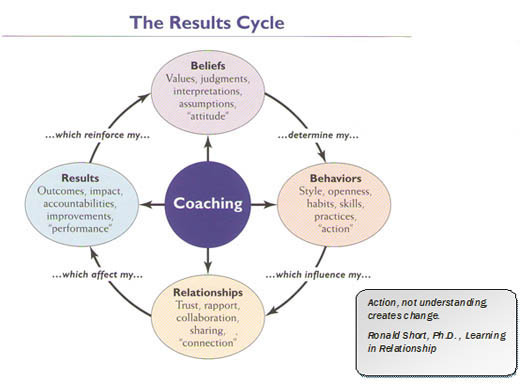 This allows for integration of behavioral changes and progress toward coaching goals and objectives. During the coaching engagement we will solicit feedback on how the process is working for you, so we can make adjustments as needed. At the end of the contracted time, a formal evaluation will be given to measure progress against coaching goals and collaboratively determine next steps.